I’ve often said the best documentaries are unintentional and incalculable strokes of luck. “Capturing the Friedmans” was a stroke of luck, “Thin Blue Line” was a stroke of luck. Kristopher Belman has similar luck. Several years ago the unknown rookie filmmaker decided to follow his local Akron high school basketball team around for a short film. One of the players happened to be the soon-to-be NBA superstar LeBron James. Once James hit the big time Belman found himself sitting a very hot property, something he caudled and took his time to craft and perfect. The simple verite documentary, now completed, is perhaps the finest film ever made on the sport of basketball – even better than the revered “Hoop Dreams”. 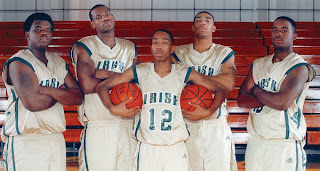 It’s 2003 and the St. Vincent-St. Mary high school basketball team are about to play in the National Championship game. Against that background Belman traces the journey of it’s five key players from humble beginnings in grade school to their rollercoaster senior year under the national sport microscope thanks to the phenomenal talent of their leader LeBron James. Belman is smart with the narrative structure. He doesn’t establish his characters in the first act, instead he staggers his flashbacks over the span of the entire film. Gradually we get to know about: Little Dru, the pint sized point guard and son of the coach who battles against the odds to play against players much taller than him; Romeo Travis, the arrogant outsider who harbours emotional insecurities because of his fractured childhood; Sian, the power forward who feels the pressure to get a scholarship and save his family from poverty; Coach Dru who takes over in junior year and succumbs to the publicity pressures of the LeBron hype machine. Belman saves LeBron’s story for the last. We are offered a rare glimpse into the birth of a superstar at every stage in his life, the heart of which is the relationship with his single-parent mother who struggled for years so her son could develop his talents. LeBron comes off as an articulate and mature teenager. He handles with remarkable poise the pressure of being the so-called “Chosen One” from his famous Sport Illustrated Magazine article. And even though his team seems to demolish every opponent, it’s not always smooth sailing. Even though we know how it’s all going to turn out, Belman is able to create suspense and narrative ebb and flow with moments of utter despair and depression which threaten the hopes and dreams of each of the characters. Belman has a gold mine of archival television footage as well as his own shot footage to work from. Nothing seems inaccessible; every aspect of the past 10 years of the players’ lives is available to show. Belman gives us glossy-slick colour, graphics, hip-hop music to amplify every emotion moment and story beat. It’s cut with the energy of a feature film. Montage scenes capture the energy and excitement of those whirlwind moments of the team’s rise to fame. “More Than a Game” reminds me of those branded Disney sports movies like “The Rookie”, “Invincible” and “Remember the Titans”,which feel like emotional manipulative ‘true stories’ of impossible comebacks, and triumphs over diversity. But “More Than the Game” doesn’t need dramatic or artistic license to create false drama. The story of “More Than a Game” couldn’t be written or executed any better, and definitely not by Disney. And all the more impressive for Mr. Belman, a lucky break which he seizes and slamdunks with authority. It's a phenomenal film. Enjoy.